So by now you’ve discovered that the church you attend is imperfect. The minister could use more verve in his delivery. Your small group has a few oddballs and that one self-proclaimed theological savant. The nursery smells like a barn. The greeters have bad breath. If you get any two Christians together, it wouldn’t take long to generate a list of issues they have with their church. But interestingly, the imperfections in your church may not be a detriment to your spiritual life, rather a God-ordained means to your sanctification. When I ministered, I would often say from the pulpit, “You probably don’t like everything about our congregation. The truth is, I don’t like everything either. But this is good, because if everything here were geared to what I like, it would be great for me, but not so great for the other members.” And so it is with you. I’m here to say that imperfect churches are a good thing. Now let me be clear—I’m not referring to serious concerns related to doctrinal purity, moral integrity, or authoritarian abuse (issues I believe are grounds for leaving a church). Let’s assume the imperfect church you attend is a gospel-preaching, Word-saturated, Bible-believing church. So we’re dealing with issues of preference. The truth is that, if we were honest, most of our church disputes don’t involve weighty issues but petty preferences. Which is why it’s good for us to be involved with a local body of believers with whom we have disagreements and varying inclinations. This is good because we don’t come together because we agree on everything and have the same partialities, but because, despite our disagreements, we are united in Christ. We are the people he is gathering from every nation, tribe, tongue, and socioeconomic level. Your continued presence at an imperfect church indicates your willingness to lay aside preferences for the good of Christ’s body. And it proves that you’re not simply going to church to have all of your senses tickled but to use your gifts to serve God’s people. This is true for both leadership and laity. When the leadership structures a church in such a way that it meets all the minister’s preferences, it creates a personality-driven church. But when the minister is willing to lay aside some of his choices for the good of the people he serves, God is glorified and the people are blessed. When the people who attend a church stomp their feet and demand that certain things at church be their way, it sows division in the church, hurts the minister, and ultimately undermines the gospel mission to the community. But when people come to church and get involved, even though there are very real things at church they don’t like, they are making a profound statement about the mission of God. We must intentionally cultivate this compromising spirit in a culture of consumerism. We have the option of picking and choosing churches, not based on anything important but our own pet likes and dislikes. I’m not discounting the importance of church culture, family atmosphere, and so on. But ultimately our congregational role as Christians is to participate in the local body of believers, to serve with our gifts, and to glorify Christ corporately. When we make our church choices based on personal preferences, we idolize what is unimportant and marginalize gospel witness. As I look at Scripture I see that God uses churches that are imperfect and clumsy, a bit off. These are the only kinds of churches God can use because the only kinds of people he has to work with are . . . you guessed it, sinners. The best way to love an imperfect church is by attending consistently and faithfully. You can’t gripe about a church you hardly frequent. You also have no idea how it encourages and motivates the heart of the ministers and staff to see you present at most functions regularly. Plus your regular attendance makes a statement to the world that worshipping God means something to you. It makes a statement to the devil that you are standing with Christ and his body. This seems small, but it’s big. Get ready early enough each week to be at church on time. I must confess that before I was a minister I was habitually late to church. I always went, but I was usually late. Years of pastoral ministry has made me realize how latecomers totally stress out the church staff. Ministers (especially of small churches) actually like to know who is going to be there and whom they can count on. Punctuality at church makes a statement about how much we care about the Lord. If we were as punctual at work as we were at church, I wonder how long many of us would keep our jobs. That sounds harsh, but getting to church early and on time helps your congregation become the church God intends it to be. If you’re supposed to serve in a particular area, make a special effort to not only be on time but be early. Give the attention to that ministry that you would give to other things you value, such as your job or your favorite hobby. Come to church with a smile. I’m not saying be plastic or inauthentic. If you’re suffering through a crisis, the church should be the first place to offer lament. Don’t come with a mask. But also don’t come with a super critical eye either. Come intending to give back to the body with your gifts and talents. Come intending to be fed the Word, but also be ready to disciple and encourage others. Come ready to love and forgive and hug and forbear. Come to church ready to forgive small and big slights. Also be pro-church. Greet guests warmly; advance the church goals and ministries with a spirit of teamwork. Be positive, not cynical. We just discussed being positive. I want to offset that by saying being positive isn’t being a flatterer. What I mean by this is you help your church by being gently discerning. If you see an area of improvement, make a note to try to be a difference maker. Ask the person in charge of that area if you can help solve the problem. In other words, rather than complaining about a dirty bathroom or a gap in the childcare, politely and kindly bring this to someone who can affect change and offer to help. The minister and the staff don’t see everything. They need some help from committed members on the ground level who can give them critical feedback and assistance on services in the church. You can prepare with prayer. Before you walk in the church doors, you might pray for your minister and the staff. Pray for the Spirit’s presence to be strong in the service and in the preaching. Bathe the entire church body in prayer. 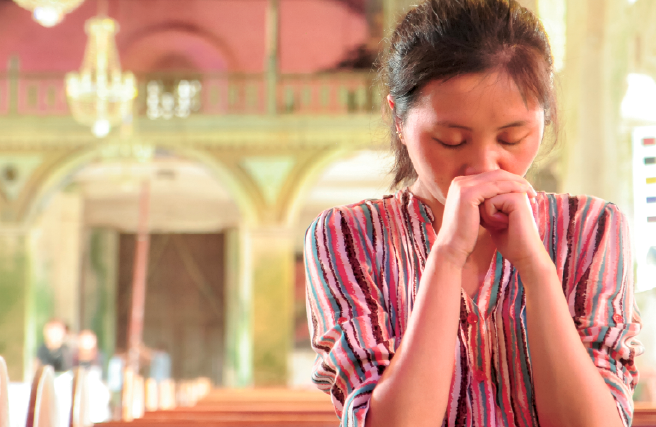 Think of some of the neediest members in your church and commit their needs to prayer. Most of all, before you walk in, pray that God will use you to impact someone’s life for the kingdom that day. You can also prepare by readying your own heart with Scripture. Be a person of the Word and doctrine so that your heart is ready to soak in the teachings. Nurture your spiritual life so that the soil of your soul is ready to be changed for God’s glory. Church is not something to simply cross off our list. Church is the expression of Christ in the world. You are the church. Be the church. Pray that God powerfully uses you to change lives. And pray that through the preaching and worship and prayer, your heart will soften to the gospel and you’ll become more like your Savior. One of Satan’s most powerful tools is to pit Christians against each other and tear the church apart through nitpicking. Instead of just trying to keep quiet and be nice, we need to prepare for battle. The armor of God in Ephesians 6 helps the church brace itself for these attacks. Where are you most vulnerable to Satan’s attacks? Prayerfully put on the armor and ask God to keep the church strong when Satan attacks its imperfections.